Syriza has won the Greek election, which is the result I hoped for. For some this heralds the death of neoliberalism. To celebrate, George Monbiot - whose journalism consistently tells me more than most other journalists - says that here in the UK we should no longer vote tactically, but instead vote for what we want. What dangerous nonsense! Monbiot says “If Labour wins in May, it is likely to destroy itself faster and more surely than if it loses, through the continued implementation of austerity.” His normal high standards of journalism based on solid research go out of the window. I have, along with the IFS and Resolution Foundation and many others, repeatedly pointed out that there is a huge difference between Labour and Conservative fiscal plans beyond 2015. It is quite possible that we will see very little additional fiscal tightening under Labour, and a lot more public investment. In looking at Labour, he sees only their departures from his own vision, and ignores their virtues and the realities of gaining power in today’s environment. He thinks Labour is currently silent on the evils of austerity because they believe in its virtues, whereas in reality they have been forced into this position by mediamacro’s obsession with the deficit. That is why they do not publicise their very different fiscal plans, but good journalism should see through that. Wouldn’t it be nice to have a prime minister who was prepared to stand up to the Murdoch press - oh wait. Wouldn’t it be nice to have a prime minister who said: “This country is too unequal. And we need to change it." - oh wait again (see postscript). To say that Monbiot’s analysis represents a profound misreading of history seems trivially obvious, but not for left utopianism. Monbiot says “Fearful voting shifts the whole polity to the right.” Where is the evidence for that? Neoliberalism did not triumph because the left decided to compromise. Yes Greece voted for Syriza, but only when half of its young people were stuck in unemployment. Is that the future that he hopes for by abandoning tactical voting? Parts of the radical left has always suffered from this misty eyed idealism, where through blurred vision everyone else looks the same. I remember being told by otherwise very intelligent people on the left that there was no real difference between George Bush and Al Gore. Monbiot described voting No in the Scottish referendum as “an astonishing act of self-harm”: no matter that the SNP tried to deceive the electorate that they would at all times be better off independent; a sorry claim given what has subsequently happened to the oil price. No doubt some said in 2010 that a future Labour government would be much the same as a Conservative government. Please, just look at the evidence. So, to repeat, anyone voting Green (or failing to vote) in a seat that Labour can win but the Greens cannot will in part be responsible for the consequences of a future Conservative government. Postscript (19/2/15): Here is a link to those seats where this might apply. An interesting question, from an academic point of view, is whether this argument is symmetrical, applying to UKIP and the Conservatives. Perhaps not in one sense. If Labour loses because of votes lost to the Greens, the reaction within the party will simply be to look for a more telegenic leader. If the Conservatives lose because of votes lost to UKIP, perhaps there is a chance that the Conservative Party will merge with UKIP, and adopt leaving the EU as policy. who plan to talk about the economy over the next 100 days. Here is a very simple fact. GDP per head (a much better guide to average prosperity than GDP itself) grew at an average rate of less than 1% in the four years from 2010 to 2014. In the previous 13 years (1997 to 2010), growth averaged over 1.5%. So growth in GDP per head was more than 50% higher under Labour than under the Conservatives, even though the biggest recession since the 1930s is included in the Labour period! You have all read, and perhaps written, that the Conservatives will focus on the economy, because they think that is their strong point. Compared to their performance on other issues, maybe it is their strong point. But relative to the previous administration, this simple fact suggests otherwise. George Osborne says: “Britain has had the fastest growing major economy in the world in 2014.” However GDP per head in the UK in 2014 remains below 2007 levels, but it had exceeded those levels in the US and Japan by 2013. The UK is not bottom of the league in these terms only because the Eurozone’s performance has been so poor. That GDP per head growth under 1.9% in 2014 can be trumpeted as a great success when it is no more than average growth between 1971 and 2010, and when we should be recovering from a huge recession, and when there are signs that this growth may not be sustainable, shows how diminished our expectations have become. (1) The Great Recession was in 2009, so it is included in the Labour government’s growth average, not that of the current government. You can see the impact of the recession on the average (the red line) in the chart below. Are they really saying that the mess Labour left was worse than the impact of the global financial crisis!? (2) This excuse implies that bringing the government deficit down rapidly (austerity) meant that GDP growth is bound to be lower. This is something that the government’s critics have long argued, and which the OBR agrees with , but the government has always denied. Are they now admitting that austerity was (really) bad for growth? (3) If a government was elected just after a major recession, you would normally expect the exact opposite from these figures to be true. The new government would benefit from the recovery from the recession, while their predecessors average would be weighed down by the recession itself. So in any normal world, you would expect GDP per head to have grown much more rapidly over the last four years than any long run average. The fact that it has grown by considerably less means that the government should have a lot of explaining to do. Growth under Labour, including the Great Recession, was 50% better than under the Coalition. So please, if you want to make your reporting on the economy over the next 100 days objective, use this fact. If the Conservatives win this election because enough people believe that they are more competent than the previous government at handling the economy, it will be a devastating verdict - on the UK media and its journalists. The ONS data can easily be found here. The fourth quarter data is not out yet, so I have taken the ONS data updated on 21st January, and assumed growth of 0.5% in the final quarter, which is the first estimate of GDP growth in that quarter. That is obviously an overestimate, as it assumes no population growth in that quarter. 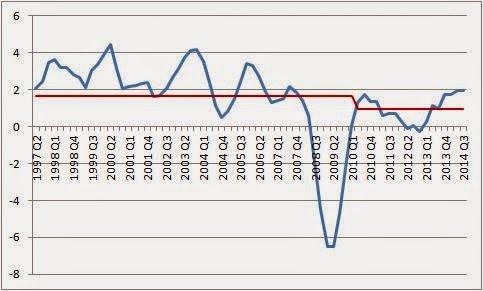 The chart uses quarter on previous year’s quarter growth rates for the actual data (no estimates), and the average shown there is simply the average of these growth rates. A tweet from Ann Pettifor inspired this post, but of course responsibility for it is entirely mine. The OBR estimate, somewhat conservatively, that austerity reduced GDP growth by 1% in both FY 2010-11 and 2011-12. That alone would raise the average growth in GDP per head over the four years from 0.9% to 1.4%. Research by Jorda and Taylor suggests austerity had larger and more prolonged effects. With Greece under Syriza about to enter negotiations with the Troika, there has been much discussion of what might happen, and what should happen. This post is in the ‘should’ category. In the past I have argued that the Troika should welcome the opportunity to put right earlier mistakes. There should be a large amount of guilt, or at least regret, on their side. I will say why in a minute, but just to show that I’m not living in a dreamland, read this FT piece by Reza Moghadam, the former head of the European Division of the IMF. In reality debt restructuring is a bargaining game, but I want to suggest a general principle that any agreement should hold to. That principle is that there should be no significant increase in unemployment above its natural rate (let’s call this excess unemployment) as a direct result of having to pay interest on any government debt. Unemployment above the natural rate when there is no excess core inflation is a waste of resources as well as being damaging to most of those unemployed, so any deal that creates such unemployment, or allows it to persist, should be regarded as the result of creditors acting against the social good. Indeed you could easily argue that it involves creditors acting against their own self-interest, because the more of an economy’s resources you waste, the less is available to pay its debts. This is why the Troika should feel guilty, because by not allowing Greece to default on all its debt back in 2010 it helped create a situation where over half young people in Greece are unemployed. Some excess unemployment was inevitable in Greece after 2010 because the country had become very uncompetitive, and the impact of this on demand had been offset by large primary budget deficits. (This problem was made worse by pre-recession cost-cutting in Germany.) However, as I have argued in the past in the context of Latvia, the efficient way to restore competitiveness is to have small but persistent excess unemployment: a ‘short sharp shock’ is much more costly. The Troika imposed much too much austerity on Greece in a futile effort to avoid full and early default. The process transferred the ownership of the remaining Greek government debt from the private sector to the public sector - other Eurozone governments and the IMF. The transfer to other European governments was wrong in two respects. First, it was another example of governments bailing out their own banks and other financial institutions with no costs to those institutions. Second, it made any subsequent restructuring of Greek debt much more difficult politically. If there had been full and immediate default there would have still been need for additional lending to Greece to give them time to adjust their public finances and avoid a large increase in unemployment, but that is what the IMF is for. If the Troika had not been involved, the IMF may well have gone for early and complete default. What about all the ‘structural reform’ that the Troika has imposed. The new Greek government is likely to introduce plenty of structural reform of its own, so encouragement from outside is hardly necessary. If it is not the structural reform that the Troika prefers, then I’m afraid that is the price you pay for having a democratic Europe. We know that some within the Eurozone bureaucracy have little respect for national sovereignty, and it is time these people were put in their place. What about the backlash from voters in Northern Europe? I find arguments that say this should be (we are talking about what should happen here) a barrier to debt restructuring hard to take seriously. Northern Europe’s politicians foolishly socialised the Greek debt held by their own country’s financial institutions. To say Greece has to pay the price of this mistake seems perverse. What about other periphery countries wanting to revise the terms they were required to accept for Troika help? Well maybe they are right to do so. And finally what about the argument that this would ‘frighten the markets’ (always a good tell by the side that uses it that their argument is weak)? The markets will be unsettled far more if negotiations break down because creditors refuse to give enough. Germany is now the third most popular country of origin for pageviews of my blog, which is something I’m very happy about. I’m sure at least some of those readers will be worrying that any renegotiation violates ‘the law’, or at least contracts that have been previously agreed. I have very little sympathy with that argument. The British government was also protecting the rule of law when it provided armed guards to ensure that shipments of grain left Ireland during the famine of the 1840s. Even if you do not accept my argument about the role that creditors played in inflicting great harm on the Greek economy and people in the past, these creditors have a clear choice for the future. Current levels of unemployment in Greece represent a criminal waste of resources and source of unhappiness, and it should be brought to an end as soon as possible. Creditors can make this happen with a small economic cost to themselves by at least suspending all interest payments until the Greek economy has recovered. It is a cost that creditors are almost certainly going to have to pay at some point anyway. As Martin Wolf says in an excellent column, “What cannot be paid will not be paid.” It would be much better for the Greek people and Europe as a whole for the Troika to admit this now rather than later. If you are familiar with this blog, you will know that I regard 2010 as a fateful year for the advanced economies in their recovery from recession. That was the year that the US, UK and Eurozone switched from fiscal stimulus to fiscal contraction. Because we were at the Zero Lower Bound (ZLB), this policy switch is directly responsible for the weak recovery in all three countries/zones. A huge amount of resources have been needlessly wasted as a result, and much misery prolonged. This post is not about justifying that statement, but taking at as given and asking what should we conclude as a result. To answer that question, what happened in Greece (in 2010, not two days ago) may be critical. To see why, let me paint a relatively optimistic picture of the recent past. Greece had to default because previous governments had been profligate and had hidden that fact from everyone, including the Greek people. Recessions rather than booms tend to be when things like that get exposed. If Greece had been a country with its own exchange rate, then it would have been a footnote in global macroeconomic history: fiscal stimulus that had begun in all three countries/zones in 2009 would have continued (or at least not been reversed), and the recovery would have been robust. Instead Greece was part of the Eurozone, a monetary union that had been implemented in such a way that it was particularly vulnerable to the threat of default by one of its members. Policy makers in other union countries prevaricated, partly to protect their own banks, partly because they worried about contagion. The ECB refused to act as a lender of last resort - we only got OMT in 2012. So the Greek crisis became a Eurozone periphery crisis. (For more detail, based on an IMF evaluation of their role in this affair, see this post.) This led to panic not just in the Eurozone but in all the advanced economies. Stimulus turned to austerity. By the time some in organisations like the IMF began to realise that this shift to austerity had been a mistake, it was too late. 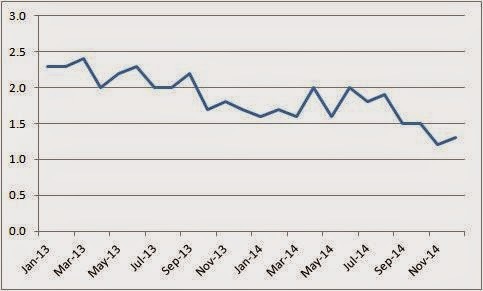 The recovery had been anemic. Why is that an optimistic account? Because it is basically a story of bad luck, which we have no reason to believe will be repeated again. When the next crisis comes along, the Eurozone will have OMT in place, and hopefully there will be some rational system for deciding when a Eurozone country that gets into difficulties should get ECB help or should be allowed to default. If this was just bad luck, we do not need to rethink how macro policy is made. Now for the pessimistic version. The political right in all three countries/zones was always set against fiscal stimulus. It is true that during 2009, when no one was sure how bad things might get, Germany enacted a modest (if fairly ineffective ) stimulus, but in the US and UK the political right opposed it. Without Greece, we still would have had a Conservative led government taking power in the UK in 2010, and we still would have had Republicans blocking stimulus moves and then forcing fiscal austerity. The right’s strength in the media, together with the ‘commonsense’ idea that governments like individuals need to tighten their belts in bad times, would mean that opposition to austerity within the political elite would be lukewarm, and so austerity was bound to prevail. While we might hope that this right wing opportunism does not happen again during a future crisis, there is no clear reason to believe it will not. Greece may have just voted against austerity, but there is every chance that in the UK the Conservatives will retain power this year on an austerity platform and the Republicans are just the presidency away from complete control in the US. If the pessimistic account is right, then it has important implications for macroeconomics. Although it may be true that fiscal stimulus is capable of assisting monetary policy when interest rates are at the ZLB, the political economy of the situation will mean it may well not happen, and that instead we get the fiscal instrument moving in the wrong direction. That means that macroeconomists have to start thinking about how to fundamentally change the way policy is done at the ZLB. However, if the pessimistic account is correct, then arguing with politicians for better fiscal policy is quite likely to be a waste of time, a lost cause. A more robust response is to argue for institutional changes so that politicians find it much more difficult to embark on austerity at the ZLB, or to allow others to effectively offset this austerity if it happens. Central banks have QE, but helicopter money would be a much more effective instrument. To put it another way, central bank independence was all about taking macroeconomic stabilisation away from politicians, because politicians were not very good at it. The last five years have demonstrated how bad at it they can be. However that move to independence was always incomplete because of the ZLB problem. We now need to make it complete. This of course raises all kinds of questions. Do we want to give additional powers to the central bank, or should another independent institution be involved? If we do give central banks more power, could this be limited to enforcing a dialogue between central banks and government (along the lines suggested here), or should we go for something like helicopter money? If the latter, what are the knock on consequences to ensure the central bank can always tighten policy as necessary? Going down that road must in my view include thinking about how to make central banks a lot more accountable, so that they do not behave like the ECB. Arguably macroeconomics has been naive in suggesting that the more independent a central bank is the better. However, we only need to go there if the pessimistic interpretation of the last five years is correct. Should we put the last five years down to bad luck, or to political economy forces that will not go away. I currently think the pessimistic interpretation is more persuasive, but I will be very happy to change my mind. Many argue that the recovery was weak because the recession was caused by a financial crisis, and it was always going to take a long time before banks would start to want to lend again. Even if you put a lot of weight on this argument, it implies a multiplier of one, not zero. It does not justify reducing public spending and employment i.e. making people unemployed when there was little chance they would find work in the private sector. The stimulus focused on tax cuts, which are less effective than increased government spending because some of the tax cuts will be saved. See Carare, A, Mody, A and F Ohnsorge (2009) “The German fiscal stimulus package in perspective” VoxEU 23/01/09. Keeping quiet about hidden motives? There is an awful lot I could talk about in that paragraph, but let me focus on the ulterior motive point. First the bit of my argument that Rentoul is referring to. Let me be honest here. I did think twice before writing this, because I knew it might evoke a negative reaction among some who read it. Why not, as Rentoul suggests, just stick to the ‘no macroeconomic rationale’ point? Now you might equally say on this occasion why taint a perfectly good scientific case about climate change with conspiracy theories about oil interests? There are two excellent reasons. First, the trouble with debating the 'scientific' arguments of this interest group at face value is that it gives the impression that there is genuine debate going on, and that the key facts about climate change are controversial in scientific terms. That is nonsense, but it is also exactly the impression that this interest group wants to create. Most people will not go through the science and realise that the sceptics case is virtually non-existent. Instead they will think the science is controversial, and so go with their instinct, or with whatever those who support their politics advocate. This is why the US has an unusually low number of people who think climate change is a major threat. Second, I think social scientists have a duty to explain the world as they see it, and not hide these truths away because it might be too much for some. Of course climate change and austerity debates are not completely comparable for many reasons. However when it comes to the macroeconomics of Osborne’s policy, I think we have now reached a similar point. Back in 2010, there was an arguable case for rapid deficit reduction, particularly as the source of the Eurozone crisis was unclear. In 2014 we know a lot more. Let me justify that with three arguments. First, the paragraph I wrote is quite truthful in describing my own thought process. I have searched hard to find a macroeconomic rationale for Osborne’s policy stance. A belief that QE is as effective as conventional monetary policy (there is no liquidity trap) comes close, but as I explained here it does not really fit with what Osborne has said (or not said). Osborne is certainly no market monetarist, as he has shown no interest in nominal GDP targeting. So there does not appear to be a coherent case for Osborne’s fiscal proposals that a macroeconomist could take seriously. Second, the idea that the real motive is a small state is not the preserve of some small group of left wing conspiracy theorists. Here I quote Jeremy Warner, economics editor of the Telegraph (for non-UK readers, a newspaper firmly to the right): “In the end, you are either a big-state person, or a small-state person, and what big-state people hate about austerity is that its primary purpose is to shrink the size of government spending.” He also wrote: “The bottom line is that you can only really make serious inroads into the size of the state during an economic crisis. This may be pro-cyclical, but there is never any appetite for it in the good times; it can only be done in the bad.” I also think many of my non-UK readers will wonder why I am having to justify what is obvious in their countries. Third, it must have become clear to many people now that reducing the deficit cannot be the overriding priority when there have been so many tax giveaways (50p rate, Help to Buy which creates large contingent liabilities, Cameron’s conference commitments, stamp duty changes that are far from fiscally neutral, pensioner bonds). Putting these down to ‘politics’, but counting spending cuts as ‘economics’, will not wash. (See Brad DeLong for the equivalent in the US). You cannot pretend that deficit reduction is driving government policy, when that driver only operates on the spending side of the accounts. Economists in the media are beginning to realise this. It is really important that political commentators do so as well, so that those without an economics background get a clearer idea of the nature of the choices they will have to make in 100 days time. Who wants the state to be larger than it need be? I couldn’t agree more, but then each state activity should be examined on a case by case basis. Osborne’s cuts are not based on analysis of that kind, because it presupposes the result (there have to be cuts of a certain size). 1) It is now widely accepted among macroeconomists (but not politicians or the media) that fiscal profligacy was only the major cause of subsequent problems in Greece, while elsewhere private excess was the main problem. I have argued that aggressive countercyclical fiscal policy before 2008 would have reduced subsequent problems. Put the two claims together and I would argue that the 2010-12 Eurozone crisis (rather than just a Greek crisis) need not have happened. OMT would have limited fears of contagion, allowing a quicker and more complete Greek default. There would have been no funding crisis outside Greece, and no need for the core Eurozone economies to immediately embark on austerity. How does the paper address these arguments? In terms of fiscal policy, it imagines reaction functions for government spending and transfers that contain a (common) countercyclical element, but also a (country specific) positive drift term, in Greece, Ireland, Portugal and Spain. One counterfactual eliminates the drift. This does not exactly fit the scenario I had in mind, because I see actual policy as not being countercyclical but (Greece apart) having less drift. However the end result is the same: a counterfactual with much more fiscal tightening before the recession. An interesting result is that tighter fiscal policy could have substantially reduced the rise in interest rates spreads in Ireland and Spain. The pre-2008 employment boom would not have happened in Greece, and would have been substantially reduced in Ireland, but the impact in Spain would have been smaller but non-negligible. It conducts another counterfactual which imagines macroprudential policies that eliminated the household leverage boom in each country. This has a significant effect in reducing the boom in Ireland and Spain. (There was no actual employment boom in Portugal.) By inference a combination of countercyclical fiscal policy with no drift, plus macroprudential policies, would have been ideal. So claim (1) seems to hold up fairly well. Of particular interest is what would have happened to employment from 2008 under a purely countercyclical fiscal policy. In Spain it would have fallen as a result of the recession, but subsequently stabilised rather than continuing to fall as it did in reality. In Ireland employment would have fallen in the recession, but would have risen again from 2010 rather than continuing to fall. This is partly because countercyclical fiscal policy would have helped, but also because lower levels of debt going into the recession would have reduced the increase in interest rate spreads, easing monetary policy. With a pure countercyclical fiscal policy the debt to GDP ratio in Greece would have stayed flat (because there would have been no boom), suggesting that the Greek crisis was essentially a result of fiscal profligacy. In Spain the debt to GDP ratio would have fallen to nearly 20% of GDP, rather than staying above 40% of GDP in reality. In Ireland public debt would have been largely eliminated. This indicates the substantial amount of countercyclical policy that was required to tackle what were very large domestic booms. (Fiscal policy would presumably have been less contractionary if combined with macroprudential controls.) It also tells us how foolish it was to have a Stability and Growth Pact which essentially ignored the need for such countercyclical fiscal policy. Francesco Saraceno draws the lesson that the real problems with the Eurozone are institutional, and I agree. The Stability and Growth Pact was misconceived (as some of us argued before the Eurozone was created), because it ignored the need for countercyclical fiscal policy. The ECB delayed acting as a sovereign lender of last resort for two years, creating a Eurozone crisis out of what should have been just a Greek problem. The conclusion I draw, unlike many economists, is that the concept of a European Monetary Union was not inherently doomed to fail. It was the way it was implemented that caused the crisis. It would be very nice if this was all about history. Unfortunately exactly the same mistakes are continuing, with equally damaging effects. Fiscal policy continues to be pro-cyclical, meaning that we had a second Eurozone recession and no real recovery from that. Monetary policy is either perverse (2011), or 6 years too late (!) and continues to openly encourage fiscal austerity. That most policy makers in the Eurozone have still not understood past errors remains scandalous. The paper attributes this to the reduced risk of union break up. I suspect it does so because it wants to make interesting comparisons between Eurozone countries and US states. My own analysis has instead focused on the danger of a self-fulfilling funding crisis when there is no lender of last resort. That danger presumably exists for US states. An interesting question which I have not examined is whether, even if OMT had existed in 2010, it would still have been better for both Ireland and Spain to have written off some of their debt. Paul Johnson of the IFS has written that under Labour “national debt [could be] around £170 billion higher (in today’s terms) by the end of the 2020s than would be achieved through a balanced budget.” That was all that certain newspapers needed to start talking about a borrowing bombshell under Labour. £170 billion is a meaningless number, and the end of the 2020s is a meaningless date. First, we should put everything as shares of GDP. £170 billion is about 10% of GDP, and debt is currently around 80% of GDP. However it would be completely wrong to infer that under Labour debt to GDP would be 90% of GDP by 2030. If they achieved current balance by financial year 2017/18, then my excel spreadsheet says that with nominal GDP growth of 4% a year, by 2030 debt to GDP would be around 65% of GDP. (A few points below 65% if investment remained at 1.5% of GDP, a few points above it became 2% of GDP.) If the Conservatives balanced the overall deficit each year debt to GDP would be about 47% of GDP by 2030. So a £170 billion bombshell actually means debt to GDP would have been reduced from 80% of GDP to around 65% of GDP. So the correct headline should have been “debt to GDP cut by a fifth in 2030 under Labour’s plans”. That is debt, which is much more difficult to reduce than the deficit. To say this is a ‘different interpretation’ is too polite – newspaper reports got it completely wrong. Who should you blame for this: Paul Johnson, innumerate journalists, biased newspapers? I’ll leave that to you. There remains a real question of how quickly debt to GDP should be reduced. In terms of the analysis I did here and here, Labour’s plans - if it did achieve current balance by 2017/18 - are tougher than the path I described as ‘fast’ debt reduction, although not nearly as tough as Osborne’s plans. (This analysis was done before the Autumn Statement, but to pretend that the analysis needs to be revised on that account gives these numbers spurious precision.) However my ‘fast’ path did not keep to current balance after 2020, but had some further deficit reduction over the next five years. (As a result, debt to GDP was below 60% by 2030 under this fast path.) I have not seen Labour commit to sticking to current balance until the end of the 2020s. So in that sense as well the £170 billion number is meaningless. What you should conclude from this is simple. First, as Paul Johnson and many others have pointed out, both Labour and Conservatives are aiming for tight fiscal policies (tighter than I and others think sensible given the macroeconomic situation), but the Conservatives’ plans involve substantially more cuts than Labour. Both involve reducing debt to GDP quite rapidly, so there is no question that both plans would not trouble the markets. So the only reason for going for Osborne’s plan, now apparently involving budget surpluses, is if you expect another financial crisis in the 2030s, and want debt to GDP to be something like it was before the last one. Or, as a headline writer might put it (but somehow I doubt many would): “budget surpluses and austerity so we can afford to bail out the banks again soon”. For those who are really into fiscal rules, there is a technical question about whether it is better to have a target for the overall deficit or the current balance. As George Osborne has moved from the latter to the former, it may be best to read his detailed analysis of the issue. Cannot find anything? Well maybe, as I note here, he is simply following the discussion in Portes and Wren-Lewis (2014), which argues for deficit targets but a separate target for the public investment to GDP ratio. In a way this is a rather trivial post, about language and attitudes as much as anything, that follows from some of the reaction to this post and related debates. One big difference between most (not all) mainstream economists compared to their heterodox or other social science colleagues is insularity. Political scientists will talk to sociologists who in turn talk to international relations people as a matter of routine. Economists by and large talk to each other. This is not because their subject matter is narrow - economists are notorious for applying their tools way beyond economics. Most of the time I think that is fine, but sometimes it is not. How do we deal with the times that are not? I want you - as either an economist or social scientist or interested spectator - to think about a visit to your doctor. Why? Because economists should really think of themselves like doctors. (I know some want to think of themselves as physicists, but what can we do.) They are trying to understand highly complex and erratic systems based on a small number of principles, where most of the time they have very little idea of what is going on. But they have data, and some of the time they can make a lot of difference to people’s lives. I kind of hope you wouldn’t, because I do not think you would get very far if you did. You might be much better off asking something like the following. It is a simple and obvious (I did say trivial) point - you will get much further if you talk specifics in a language your doctor will understand, rather than in generalities and terminology they will not. Economists want (or need) to know why their approach is missing key issues or linkages which compromise their analysis, just as the doctor needs to know why they might be recommending the wrong treatment. You would not insist that your doctor needed to have studied economics before they can be a good doctor. But if you were an economist, would you think it legitimate for your GP to respond like this. Now as an economist you know that such a response from your doctor would be both arrogant and naive. The doctor should ask about the quality and objectivity of the information they receive, and know full well that drug companies exist to make money. But might your response to a social scientist be as arrogant and naive? Let me take a real world economic problem: the response to the financial crisis. Some have suggested that banks have become too large and need to be broken up, or that the activities of high street banking need to be separated from the activities of the casino. Your economic analysis tells you that networks of many small entities can be as subject to crises as networks involving a few large banks. You are also able to devise a system of Chinese walls that mean that the activities of the casino can be separated from those of the high street even within the same company, and your political masters seem to prefer this approach. You recognise that different assets differ in their liquidity, and so you devise complex weighting algorithms for computing capital ratios. Your suggestions form the basis of negotiations between officials and bankers, and a set of rules and regulations are agreed. And you realise that right from the start you made the wrong choice. You decided to focus on what you knew, which was how to design systems that worked well as long as those systems remained unchanged, but which were not robust to intervention by self-interested parties. In short, they were too open to rent-seeking. You realise that actually the best thing to have done was to break up the banks so that their political power was forever diminished. And you recall a conversation with your social science colleague when this all started, who might have been trying to tell you this if only you had understood the words he was using. This is a post about why the taboo against helicopter money or money financed fiscal stimulus is irrational once we have Quantitative Easing, but might nevertheless be in the interest of some groups. Many macroeconomists have argued that we shouldn’t think about central banks in the same way as private banks. A central bank can never be insolvent, at least as long as people use the currency it issues. It can cover losses by creating more money. All that matters, from a macroeconomic point of view, is whether it has the ability to do its job, which is to control inflation. I do not want to talk about controlling inflation here. Instead I want to talk about these losses, and in particular who gains when these losses are made. Macroeconomists tend to focus on the controlling inflation point, so let me avoid that by imagining a really simple world. There is a constant price level target, and base money velocity (nominal GDP/money) is constant in the long run, so base money must return to some constant value in the long run to meet the target. In the short run velocity is not constant and we can have recessions due to demand deficiency in the usual way. Think about Quantitative Easing (QE). The central bank creates money to buy government debt in the market at a time when that debt is expensive, because it only does QE when interest rates are low. Suppose it just so happened that all this government debt that the central bank buys comes from pension funds. These funds sell their debt, take the money and keep it as money. After some time, the economy recovers, interest rates rise and the price of this government debt falls. The central bank no longer needs the debt, and it wants to reduce the money stock to get to the price level target, so it sells the debt back to the market, or more specifically to the same pension funds it bought it from. As the price of these assets has fallen, the central bank makes a loss. The pension funds gets back the debt they originally sold, but they have some money left. They have gained. Good for them you might say - why should I care? Well the central bank is concerned that it has not got all its money back (it made a loss), and to control inflation it needs to take more money out of the system. It asks the government to recapitalise it, which the government does by raising taxes. What has in effect happened is that money has passed from the taxpayer to the pension fund. If you think that my assumption about price level targets and constant long run velocity was somehow critical here, imagine the case where to meet its inflation target the money newly created in the long run (the loss on QE) did not need to be taken out of the system. The pension funds gain but no one seems to lose. But if the expansion of money had been via a helicopter, then every citizen would gain instead. So why is acceptable to create new money and give it to pension funds (through losses on QE), but not create money to give to ordinary people or the government? The former is called monetary policy and is OK for a central bank to do, but the latter is called fiscal policy and this the central bank cannot do. Why does this matter, apart from the distributional point? Because as a means of stimulating the economy in the short run the effectiveness of QE is highly uncertain compared to the effectiveness of direct transfers to citizens or public works. We seem to be stuck with an ineffective form of stimulus, because something more effective is taboo, or goes by a different name. To repeat it in a simple but more provocative way: a central bank giving money to people or governments is out of the question, but a central bank giving money to parts of the financial sector is just fine. That is a very convenient taboo for some. Suppose this is government debt issued many years ago, when interest rates were 5%. So debt with a nominal value of £100 pays 5% interest. If interest rates are now 2.5%, then this debt is more valuable than its nominal value - indeed someone would pay you something near £200 for it if it had a long maturity. However if interest rates go back to 5%, the value of the debt would fall back to £100. Assume Ricardian Equivalence does not hold, so giving money away now is expansionary even though that money has to eventually come back when the central bank is recapitalised. If the money financed fiscal stimulus was in the form of additional but temporary government spending, and when the central bank was recapitalised the Treasury paid for this by temporarily reducing government spending, we get what I call a ‘pure’ money financed spending stimulus. I know of no theory which says that would not be expansionary. If you want to be topical, you could think about creating money to buy foreign currency instead. The Chancellor gives a huge pre-election bribe to the moderately wealthy over 65s, and describes the fact that everyone who can is trying to get hold of the bribe (and completely overwhelming the NS&I as a result) as a great success. Chris Dillow describes this as corruption. To their credit, right wing think tanks have also condemned it for what it is. But the Chancellor says this is all part of his economic plan. I suspect the penny is beginning to drop in mediamacro. This was supposed to be a government where deficit reduction was the overriding priority. It was of such importance that it was worth the risk (which materialised) of delaying the recovery until 2013 to achieve. Hard, sometimes painful choices had to be made to achieve the goal of reducing the deficit. A Chancellor who was prepared to do unpopular things for the greater good. The essence of responsibility. Unless you were a top rate tax payer, of course. Or, following the Prime Minister’s conference speech last year, a moderately well off taxpayer. And now if you are moderately well off and over 65. Penny dropped? But this last example also tells mediamacro a difficult truth. Its modus operandi is that it can rely on the opposition to expose such things, but Labour appears to have been silent on this. Obviously, because these kind of bribes work because those that receive it are thankful and the much larger number who pay for it are not so fussed. So it needs to seek out those who will call a spade a spade. It has a responsibility to do so. This time it could use right wing think tanks. Next time it may have to resort to economists who write blogs. Chris Giles, economics editor of the FT, wrote an interesting opinion piece a few days ago. It appears at first sight to be an attack on Labour’s record in opposition. But it ends with “the intriguing thing about Mr Miliband’s Labour party is that its broad economic prospectus for the 2015 general election is perfectly sensible.” In contrast “the Tories’ plans appear ideological and border on calamitous for many public services.” If you want more detail on this, see my debate with Oliver Kamm in Prospect magazine. So his article is a form of puzzle: how did responsible Tories and reckless Labour change places? One possibility, of course, is that there never was a puzzle. Chris lists many alleged failings by Labour, but a lot look superficial and presentational to me. Furthermore (and I know Chris will not want to admit this) when Ed Balls said Osborne was cutting too far too fast, he was right. In particular, public investment (school repairs, flood prevention) was cut immediately when there was no need to do so to meet the coalition's fiscal rules. Those who think it had to be done to appease the market should reflect on the fact that Britain lost its AAA rating because of weak growth, and pretty well everyone thinks that public investment has the largest GDP multiplier. It is the media’s responsibility, which Chris for his part has grudgingly fulfilled, to point out - one way or another - who has the more responsible macroeconomic plan post 2015. The opposition will not make that case, because it has become terrified of being labelled spendthrift. Yet it is hard to find a macroeconomist who does not think Labour has the better macro policy from 2015, whatever their views about 2010 austerity. A responsible media needs to get this point across, just as it needs to point out pre-election bribes. Once upon a time NS&I was just a way that the government could sell its debt to ordinary people at slightly below market rates because it was safer than banks. However after the financial crisis, when it became clear how risky banks were, the government seems to have contracted the range of products that NS&I sell, I guess because of lobbying by these same banks. Once you could buy indexed linked assets from NS&I - no longer. Now it has become a vehicle for giving bribes to selected groups of savers. This is the ‘common pool problem’, one of the reasons economists give to explain deficit bias, which is of course being irresponsible about the deficit. What does the end of the Swiss Peg tell us about central banks? A lot of the discussion in blogs about the end of the Swiss exchange rate peg has focused on whether the original peg, which started in September 2011, was a good idea in the first place. This post asks a rather different question, which has wider relevance. The interesting question is why the central bank ended the cap. Perhaps the cap was always meant to be a transitional measure, to allow firms time to adjust to a loss in competitiveness. (Here is the official explanation.) This is not that convincing. If the central bank was worried that its producers were becoming too competitive, it could have changed the cap from, say, 1.2 CHF per Euro to 1.1 CHF per Euro. Removing the cap completely would only make sense if you thought your safe haven status had reached some kind of equilibrium, and with the Greek elections and other things currently happening that seems unlikely. Even if you did think this, caution might suggest testing the market with a more appropriate cap and seeing how much defending you had to do. As a result of ending the peg, the Swiss Franc has appreciated substantially, from 1.2 CHF per Euro to around 1 CHF per Euro, even though the central bank has lowered the interest rate on sight deposit account balances that exceed a threshold to −0.75%. There seem to be two alternative interpretations. The second interpretation is that the open ended money creation that the policy implied just became too much for the central bank. In theory the central bank could go on creating money and buying Euros forever. As long as the exchange rate peg was reasonable this policy could be consistent with its inflation target (the target is ‘below 2%’, while actual inflation is currently negative). If it ever decided it was not and there was too much Swiss money around, the policy could be reversed by selling Euros. The central bank might make a loss when this was done, but economists generally dismiss this as a non-problem (a central bank is not like a commercial bank), just as they dismiss the same problem with conventional QE. But perhaps central banks do not see things this way (HT MT), because they worry about the political consequences of such losses. If this is the case, then this is something that economists need to respond to in one way or another. The discussion in the media, as often with mediamacro, is obsessed with the markets. The Guardian had a link entitled “Swiss franc - what the economists say”. What you got were 6 City economists, who wrote the kind of thing City economists write. Now I’m sure the Guardian will say they needed something fast, and academics - even academic bloggers - are unreliable in that respect. But please label this properly: you are getting the reactions of City economists, whose primary concern is what this all means for the markets, and not what it means for ordinary people. Economists have a theory, Uncovered Interest Parity (UIP), which says that short term capital flows like this should not influence exchange rates, because the market will keep rates close to fundamentals. It does not work too well, partly I suspect because the market has little idea what the fundamentals are, and partly because no one in the market is prepared to take bets that last years rather than days. Switzerland has a really large current account surplus, which since 1997 has averaged 10% of GDP. The reason for this surplus is complex, but it suggests that there is scope for a gradual real exchange rate appreciation over time. Source: OECD Economic Outlook. The level is arbitrary, at 2010=100. A rise is an appreciation, which means a loss of competitiveness. 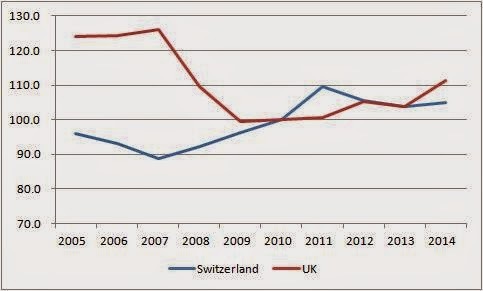 The average level of this measure of Swiss competitiveness was around 96.5 from 1998 to 2004. However the suggestion by Tony Yates that every blogger should be given a job at the SNB seems to be going too far. I suppose I should say something about this, even though I find it painful reading his speeches. Not because they are so partisan - what would you expect? Perhaps I can describe it by comparing it to an academic reading a student’s essay. With something like Vince Cable’s speech last year, you can read whole paragraphs quite happily, and then make a comment at the end like ‘yes, but you have ignored this etc’. With Osborne’s speeches, you feel the need to get the red pen out after every sentence. Each sentence seems as if it is crafted to mislead. Does this give a rather different impression? But read it carefully - does he say anything that is clearly wrong? As I say, it is calculated to mislead, and the speech is full of this stuff. You may think that just means he has very good speech writers, but this makes it hard for an academic to read, and maybe an odd thing to do in an academic lecture. If the invitation was given because the RES was hoping to get something more substantial than the usual Osborne fare, I fear they will have been disappointed. Still, let’s put that aside and talk about fiscal rules. I have argued that the form of Osborne’s original rule - achieve a particular deficit target over a 5 year rolling horizon - is very sensible for normal times. Here he proposes something that seems different - to start operating once the budget has got to a surplus. He distinguishes between good times and bad times. In good times the budget should be in surplus. In bad times, as called by the OBR, the budget can go into deficit. 1) To allow debt to GDP to go up substantially when there are occasional large negative shocks (which are not followed by large positive shocks), it makes sense to have debt to GDP falling in more normal times. I recommended such an approach in 2009. 2) This can be done without going for a surplus in normal times, just because of GDP growth. The exercise I did showed that. What is optimal obviously depends on the size and frequency of shocks, and the extent that fiscal policy is actively used to offset the shock. In my exercise, I allowed for another Great Recession in 2040, and thereafter every 40 years. I also allowed for much more fiscal stimulus than occurred under Obama. I assume Osborne would not allow any fiscal stimulus. Despite this, I still had debt to GDP trending downwards, with a target in normal times that was always a deficit. 3) One interesting and clear difference between his new and old rules is the focus on the overall deficit rather than the current balance. This is also something that Jonathan Portes and I recommended in our paper. It has to be combined with a separate target for public investment as a share of GDP, and in his lecture Osborne said that in the next Parliament capital investment will grow at least in line with GDP. 4) His proposal appears to give rather more influence to the OBR during these negative shocks. Jonathan and I also suggested an enhanced role for the OBR. In our proposal large shocks would be identified by the central bank suggesting interest rates might hit their zero lower bound, but we also said the OBR should be involved in thinking how deficits might evolve after the shock. So there are some sensible ideas here, although the failure to acknowledge the problem of liquidity traps remains. There also seems to be an unnecessary obsession with surpluses, but I expect that is just a consequence of his short term goal of shrinking the state. Who is lying about UK budget plans? The OBR test. How good has the UK recovery been?